• Bring all ingredients and 1/4 cup water to a boil in a small saucepan, stirring to dissolve honey. • Reduce heat to low; simmer, stirring occasionally, until reduced to 1/4 cup, 7–8 minutes. • Strain into a medium bowl. Let sit for 15 minutes to thicken slightly. DO AHEAD: Can be made 5 days ahead. Cover; chill. Rewarm before using. • Place a 6-quart saucepan with a steamer basket and 1-inch of water in the bottom, over high heat, cover and bring to a boil. •Place the wings into the steamer basket, cover, reduce the heat to medium and steam for 10 minutes. • Remove the wings from the basket and carefully pat dry. 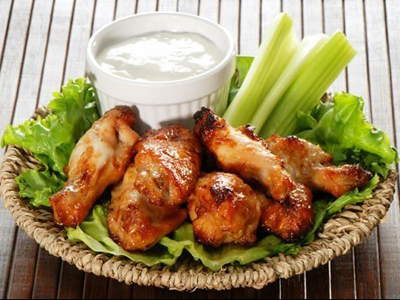 • Lay the wings out on a cooling rack set in a half sheet pan lined with paper towels and place in the refrigerator for 1 hour. • Preheat the oven to 425 degrees F.
• Roast on the middle rack of the oven for 20 minutes. • Turn the wings over and cook another 10 minutes or until meat is cooked through and the skin is golden brown. • Line another baking sheet with foil. • Add the wings to ginger-soy glaze and toss to evenly coat. • Place wings in a single layer on prepared baking sheet and bake until glaze is glossy and lightly caramelized, 8–10 minutes.